The Metaphysics of Night acknowledges a post-secular philosophy, one that puts philosophy into serious dialogue with religion, rather than considering religion a thing of the past. Matthew Del Nevo deals with the cultural unconscious, inseparable from religious consciousness, and draws on psychoanalysis and literature as well as philosophy. 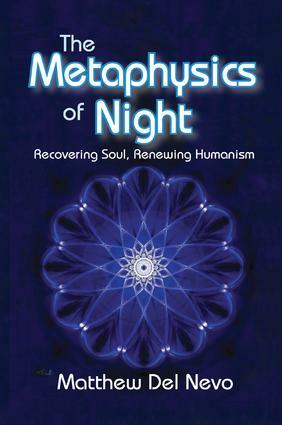 The metaphysics of the night is Del Nevo's metaphor for the deep and mysterious expanse of the soul. Philosophically, the book is critical of Enlightenment presumptions about knowledge and truth and overly spiritualizing tendencies in religion. Its critical edge cuts against materialist and historicist tendencies in the humanities and abstract intellectualism in philosophy. Arguing for strong aesthetic values, Del Nevo defends and explains soul and soulful experience, the creation of depth, the ineffable, real presence, beauty, and saving words, noting that the sources of all these are in us, but often are blocked. Each of the five parts of this book testify to what the author notes may be forgotten, but which ought not to be forgotten. It is necessary for life as socially, religiously, and educationally instituted within culture and as constitutive for culture. Del Nevo deals with sensibility as a form of wisdom and instinct that is not cognitive or knowledge/information based. He argues for a shift of emphasis in culture from intellect to intuition. This well-written work, filled with Catholic, philosophic, and artistic thought will be of interest to all philosophers, theologians, and students of culture.